If you are pregnant, the best way to protect yourself and your unborn child when driving or riding in a vehicle is to always wear a seat belt and keep the lap part of the belt as low as possible across the hips. Each time you have a checkup, ask your doctor if it is okay for you to drive. • When driving, sit upright and adjust the seat as far back as possible while allowing full control of the vehicle. 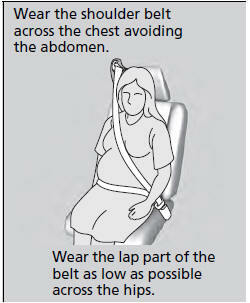 • When sitting in the front passenger’s seat, adjust the seat as far back as possible.